French niche line Jul et Mad recently released its fourth fragrance, a "green chypre/citrus amber" scent called Aqua Sextius. It was developed for Jul et Mad by perfumer Cécile Zarokian, and it includes top notes of bergamot, lime, lemon, orange, grapefruit and green notes; heart notes of eucalyptus, mint, marine notes, mimosa, white flowers and fig; and base notes of labdanum, ambergris, cedarwood, guaiac wood, oakmoss and musk. 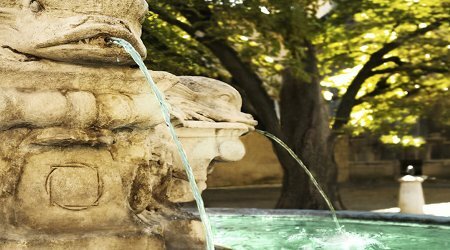 "Aquae Sextiae" was the ancient name of the French city Aix-en-Provence, founded by the Roman consul Sextius and famed for its thermal springs. Jul et Mad's Aqua Sextius is designed to evoke a summer evening in this "City of a Thousand Fountains," complete with cool breezes, sun-warmed stone and garden greenery as well as distant forests and the Provençal countryside. The official description reads in part, "Only the crisp sound of ice cubes in the glasses and the burst of joyous laughter mark the soft melody of the running water that slowly fills the sculpted basin, coupled with the murmuring of the [plane tree leaves] all around us…"
That mention of the "ice cubes in the glasses" is key for me, because Aqua Sextius' opening phase reminds me of some ideal summer cocktail concocted from lime, mint, gin and very cold tonic water; if I smell it with my eyes closed, I can believe that freshly sliced limes and other mouth-watering citrus fruits are right there in front of me. However, as far as fruit goes, I'm really not a fig fan, so I was relieved to find that this fig note is light and delicate. The white florals are very subtle. Aqua Sextius is primarily a hesperidic and herbaceous fragrance, with a touch of wateriness. Its wood-y base is a bit more shadowy, with a hint of saltiness (perhaps from the ambergris). Lastly, this fragrance lasts much longer than I would have expected. Although the citrus notes gradually darken and dim, becoming less cologne-like, they don't completely vanish; and the sheer oakmoss and warm cedar and guaiac have excellent endurance. Aqua Sextius tilts a bit more masculine than feminine, but overall, it's like a crisp white shirt that can be pulled off by either gender. Aqua Sextius isn't an uncanny match for my personal taste the way Stilettos on Lex was, but I'm finding it perfectly refreshing and suitable for hot July days. Once again, Jul et Mad has created a fragrance that updates a classic genre without sacrificing adult sophistication. Try it, if you're in the mood for something green and cool. Cheers! Jul et Mad Aqua Sextius is available in 50 ml plus 7 ml travel atomizer ($280), 20 ml (€95), and 5 ml (€12) Extrait de Parfum through the Jul et Mad website. Love the color of the juice. Seems like this would be an interesting fragrance. I love oakmoss in a scent. It’s one of those rare cases where the color really suits the “juice”! This does sound lovely, and I was all set to try it until I went back and checked the prices. Wowza! $280 for 57 ml of what is basically a long-lasting cologne? I think not. Niche rarely comes cheap! The concentration is an extrait, so I can’t imagine needing a bottle that big unless you *really* loved the fragrance… good thing they offer smaller sizes. I have a sample but haven’t tried it yet but will do so soon. Or maybe I’ll take it on vacation and it will be in my sample grab bag for next Friday! It would be a perfect vacation fragrance. Have a wonderful time! I completely agree with you, Aqua Sextius is a really lovely and cold cocktail of citrus, herbal elements. And it lasts all day even in the hot weather. This is the perfume that I awarded myself with to celebrate obtaining my master’s degree. I’m going to enjoy my big bottle for a long time, as you don’t need more than 3 sprays (wrist, wrist, neck) to smell great all day. Congratulations, Lucasai! That is a big achievement. Enjoy your accomplishment, and your new scent! I really ought to try this as I lived in Aqua Sextius for a year, a long time ago. My most remembered smell there is of the market. In Aix there was a big market in front of the Palais de Justice on Tuesdays, Thursdays and Saturdays. On Monday, Wednesday and Friday there was a smaller market on the square in front of the Hôtel de Ville. The quality of the fruit and veg there was amazing. Tomatoes tasting of tomato, wonderful leaks and lettuces, etc. The market smelled of a mix of the vegetables and on the big market days of cheese and fish and sausages as well. This fragrance sounds nothing like those (fondly remembered) smells but very nice all the same. Thanks for the review!